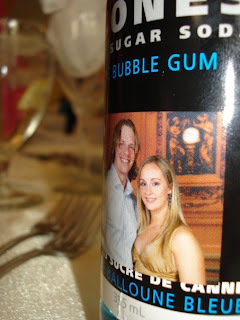 Back in the day wedding favours had little to no place in a wedding budget. They had no theme and came in three different flavours: fire (matches), raisin (fruit cake wrapped in a doily) or nut (Jordan almonds). Wow, have times changed! I mean, the entire dynamics of weddings have changed, so it comes as no surprise that favors must also evolve. There are countless websites selling silver pears and apple cider packages by the hundreds. My issue with these is that they can be very expensive (sometimes up to about $5 a piece!) and in the end, not very original. A big thing people say all the time about favors is they are a waste of money, no one uses them, takes them home, eats them, etc. I don’t think usefulness is actually the point of a favor. It is to thank your guest with a tiny token of appreciation, and these days, add to your theme and décor. I am a very detail oriented person, and favors are one thing I definitely do not agree on skipping out on. Now on to a little less expensive, yet a little more labour intensive favors, those of the homemade variety. You don’t have to be Martha Stewart’s apprentice to be able to pull something like this off. When you are planning a wedding do not be afraid to ask some of your more creative friends and family members for help, most of the time they will be more than happy to. The first fairly easy and inexpensive idea is homemade magnets. These are made out of glass a stone, the one’s that people buy for fish tanks, flat on the back, rounded on top. You can buy bags of these at most craft stores for very little money. Then a good craft glue and a coil of magnetic tape, tissue paper in your wedding colour and however many favour tins with clear tops you will need, and that’s it for supplies. The fun thing with these is you can make whatever pictures or words you want. For Alicia and Neal Bateman’s wedding this past spring we typed “live, love laugh” about a million times on her computer and cut them into circles, used the white glue (which dries clear) to attach them onto the back of the glass stone and then attach a square of magnetic tape. 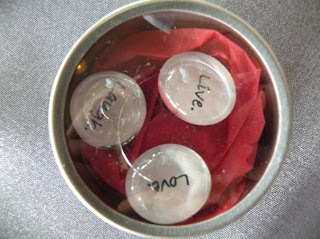 To finish the project off, cut a small piece of tissue paper into each tin and place three magnets in each tin with the words or pictures facing out. Voila! Each favour works out to be about $1.40 total, which is quite affordable, and these were a big hit. Another idea I was so fond of I considered it for my own wedding is little robin’s egg nests. These are so cute and go with quite a few themes, colours and décor. Taste wise, I personally like no bake cookies to be the ones with coconut and oatmeal, but the one’s I found were with Chow Mein noodles. 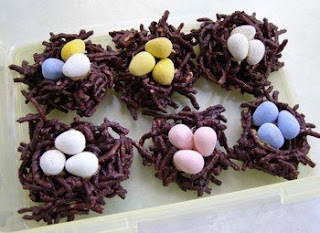 Then you can use either mini eggs or Jordan almonds for the eggs. So cute. You can double these as name cards by placing the names on little sticks and poking them into the nest portion. These work out to less than a dollar a piece. 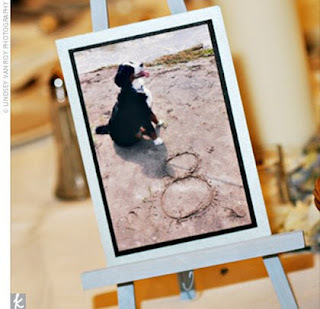 A very affordable and very fun favor idea. Now, this post could go on and on, but the point of it is to just give you a few ideas to inspire you and then go from there. This last idea is something unconventional, but seems like it may be a growing trend. People that are a bit more practical with their money may appreciate this one. I have decided for our favors we will be doing a “in lieu of favors” donation to the SPCA in Calgary. Now of course I still want to have a creative spin with this. What I am hoping to do, is to visit the SPCA with Josh and visit with a number of dogs (possibly cats and rabbits, but Josh is more of a dogs only guy) and bring numbers along, have a photo shoot with several dogs, as many as there are tables and do portraits of the dog sponsored at each table with a write up about them such as “My friends Brittany and Josh would like to thank you for sharing this wonderful day with them, and in lieu of favors, they have donated money in your honour to help me survive, thrive and hopefully find a forever home. (Dog’s name, breed, age).”. Some people may find this a bit off the wall or odd, but no one that knows me will. I love animals and from a young age I told my parents the SPCA would be the only ones put in my will, ha ha. 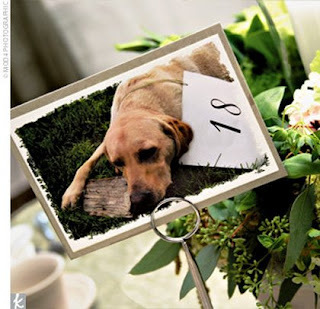 Every couple has different charities or causes that mean a lot to them, some environmentalists could plant a tree in every guests honor, or give money to the cancer society and do black and white photos of people you are honouring or remembering on each table. The nice thing about this idea is it is a feel good favour and can be very personal. What ever your budget or theme is, a favor can really tie things together, and as much as many of them get left behind, there are individuals that enjoy and appreciate a favor, and if anything, they make a great conversation starter, just look at me, I wrote for an hour about them!